Hello everyone, this is Rana. Well, I attacked my little pile of black scraps in the hopes of making them disappear. But alas, there were more of them than I thought! And I even sewed all of the solid blacks together to make the inner border and used Kim Diehl's scrappy binding idea to eliminate as many more as possible. But, it was a losing battle. 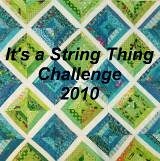 So I guess I will just have to make another string quilt with black in it. What a pity! Can't wait to see what wonderful things all of you are doing with your scrap piles. Nice colour combo. Its amazing how strings multiply!! Joanne, That is so true. Every time I see another color combo I like, I want to make one too. I like the color combination red and tan...beautiful string quilt. Love the colors you used in this.